Bizarre though the whole thing may sound, this is in fact what over a hundred students - the vast majority of them from Edinburgh University - were up to at the end of last summer. 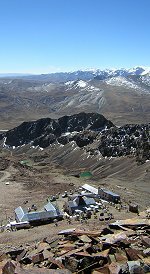 Five teams of people each spent nine days at Chacaltaya laboratory in the Bolivian Andes, 5200 metres above sea level - approximately four times the height of Scotland's tallest peak. At this chilly altitude, the air is twice as thin as it is down in Edinburgh, and not surprisingly, when you're only getting half the usual amount of oxygen, you don't feel too great. Upon first arriving at Chacaltaya, even climbing up stairs is a major effort. Many people who ascend to high altitude suffer from so-called Acute Mountain Sickness - with headaches, dizziness, nausea and other unpleasant symptoms - and a few develop life-threatening illnesses. However, the details of how the human body responds to altitude are still poorly understood, which is the reason that the Apex Altitude II expedition was carried out. Why Viagra? The drug has the same expanding effect on the blood vessels in the lungs as it does on other well-known organs, and the theory is that this might help the body cope with thin mountain air. To test this idea, some of the students on the expedition were given the famous blue pills, while others got vitamin supplements, and the rest took a useless placebo. It was a blind test, so nobody at the lab knew who was taking what (although we had fun speculating!). Numerous measurements and samples were taken throughout the expedition, to determine if either the Viagra or the vitamins were helping our bodies to cope with the altitude. This article was written for Hype, the Edinburgh University Students Association magazine, in 2003.